Spring cleaning tips on Chinese new year. Need help with your home spring cleaning? Kitchen cleaning in your home can be one of the most complicated subjects for home owners and because of this complication many people make a lot of mistakes as well while cleaning their kitchen. I am sure you want to avoid these kitchen cleaning mistakes and that’s why below I am sharing 12 worst mistakes that people make in kitchen cleaning, so you can avoid it. Not following proper cleaning steps: When people do the cleaning in kitchen then most of the time they do not follow the proper steps for cleaning. In order to avoid this trouble, it is recommended that you make a plan while cleaning your kitchen and you follow that plan to avoid any trouble in the same. In this plan you should start with cleaning of upper area and you should do the wiping task in last. Not using right cleaning solutions: Using vinegar or lemon for cleaning all kind of surface is one of the worst mistakes that people make in their kitchen cleaning work. You need to understand this basic thing that vinegar or lemon is not suitable for all kind of surfaces. So, when you do the cleaning in your kitchen make sure you use the cleaning agent wisely. Not reading the instructions: Not reading the cleaning instructions is considered as one of the biggest mistakes in the kitchen. If you also think you can clean your kitchen appliances or other delicate materials without reading the instructions, then you are making a big mistake and I would suggest you to avoid this error to get the better result from cleaning of your kitchen. Choosing wrong tool for the job: Not choosing the right kind of tools is another mistake that many people make while cleaning their kitchen. If you will use the right kind of tools and things to do the cleaning of your house, then you will be able to get the best result with it. Hence, it is recommended that you choose your tool of cleaning in a wise manner. Using dirty cleaning tools: Using really old and dirty tools cleaning of kitchen is always one of the worst mistakes that you or anyone can make during this work. 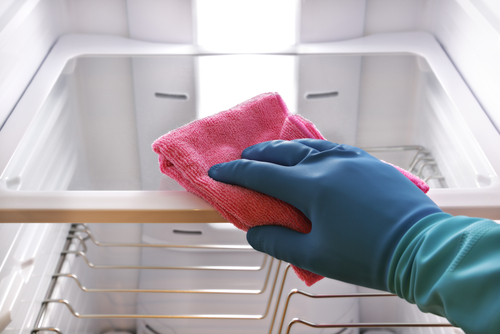 All the old sponge, clothes and similar other things can have lot of bacteria’s and harmful micro organisms in it that can make your kitchen even dirtier and unhygienic. Therefore, it is strongly recommended that you use only clean tool and cloth for cleaning of your kitchen. 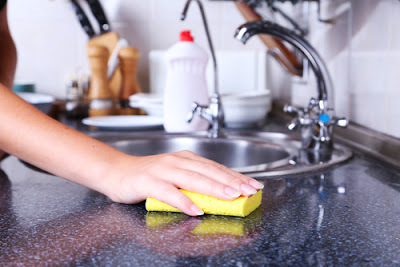 Soaking the surface for a long time: Soaking your wooden kitchen countertop for long time can be a really horrible mistake that many people make while cleaning their kitchen. Because of this mistake water might go inside the wood and it can affect the wood in a negative manner. So, if you wish to avoid this mistake from your kitchen cloning then make sure you never soak the kitchen cabinet for a very long time. Ignoring the cleaning of oven: It doesn’t matter that you have a gas oven or microwave oven, over a period of time you will get a lot of grease in it. If you will not clean the grease from your oven then you will end up having a lot of problems because of it and that will be one of the worst cleaning mistakes for you in your kitchen. So, I don’t have to explain that you need to pay attention on this part as well doing your cleaning work in the kitchen. Ignoring the cleaning of fridge: Your fridge is one of the most essential things in your kitchen and if you will not keep it clean, then surely that will be a major mistake by you in cleaning of your kitchen. In order to avoid any complication or trouble it is strongly recommended that you keep your fridge clean and you do deep cleaning also on regular manner. Also, at the hinges section you might see some foreign object such as match sticks, food particles and other things to avoid any error in your kitchen cleaning. 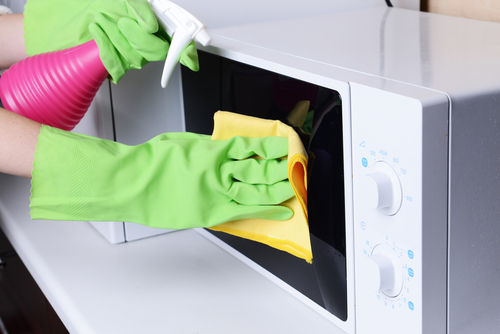 Not doing regular cleaning: You can clean the rest of your house on a weekly basis, but if you will try to do the same things for your kitchen, then your home will start stinking in almost no time. Also, this lack of cleaning can make you vulnerable to so many health hazards as well, which is not good for you or for your family. So, it is strongly recommended that avoid this worst mistake and you do the basic cleaning of your kitchen on regular manner. Not emptying trash bin every day: Ideally you should empty your trash bin from kitchen every day and if you are not doing that then consider that as one of the biggest mistake by your side. To keep your kitchen clean you have to get rid of all the waste material from your trash bin as soon as possible. If you will not do this, then you will end up having a lot of complications or troubles because of this mistake. So, make sure you empty the trash bin clean on daily basis while cleaning the kitchen in your home. Ignoring the cleaning of cabinets: Cleaning of cabinets is also very important in the kitchen cleaning work and if you will not do that, then that will be a big mistake from you. As I already explained it earlier as well you just need to pay attention on the cloning of your cabinets as well to avoid any complication or trouble from it.